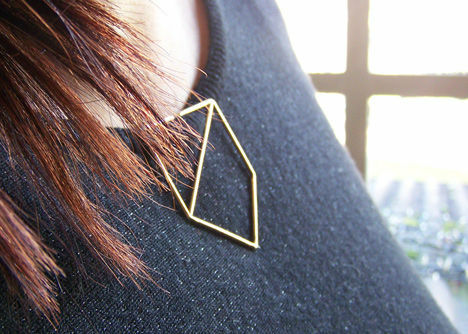 We are so used to wearing jewelry suspended around our necks and our wrists. But what if you took away the chain and connected the jewelry to clothes for support? That's the idea behind the LessIs collection by Italian designer Maria Jennifer Carew. She said, "LessIS is a collection of pendants born from the idea of simplifying as much as possible the concept of necklace. Today, accessories are a key element in any outfit, so I decided to focus on the concept of necklace where often the most important role is played by the pendant and not by the chain that supports it." 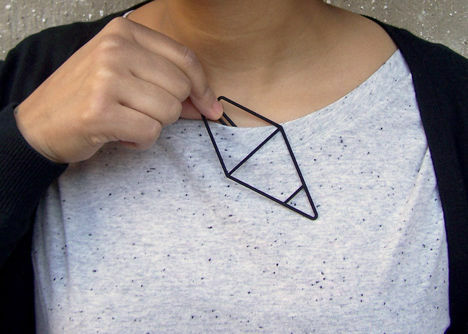 It is a clever way of reinventing jewelry. Maria comes from a furniture and product design background so it is not surprising she brought a modern minimalist look to her designs. 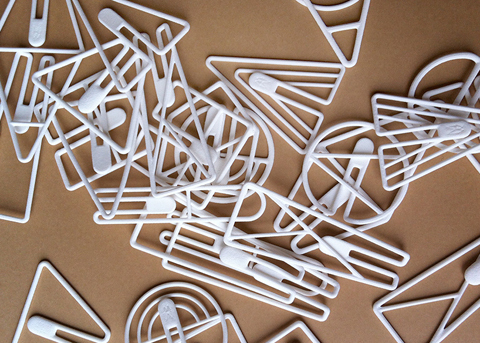 The functionality of her stylish pieces reminds one of paper clips only with cooler shapes! 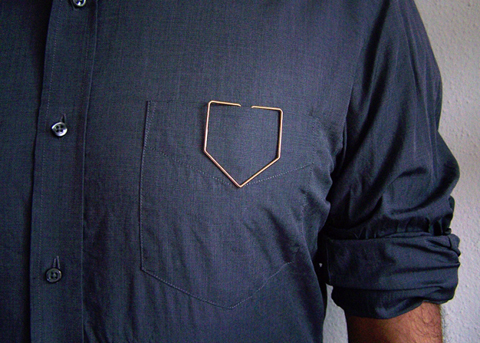 Her jewelry can be worn on the edge of just about any place - plackets, necklines, pockets etc. And they are unisex. 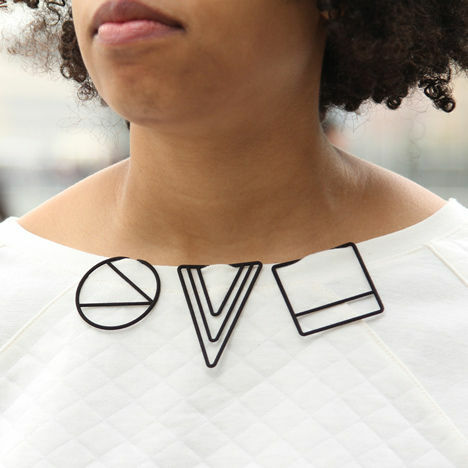 Her designs can be worn singly or in groups. 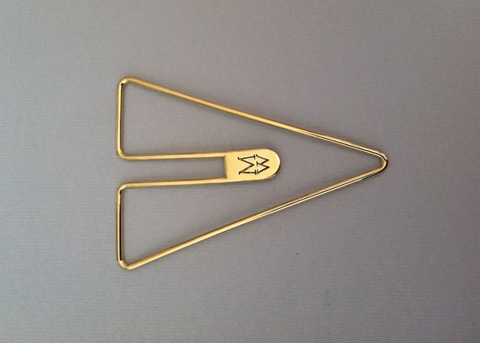 They are available in bronze, brass and black or white nylon from her shop. 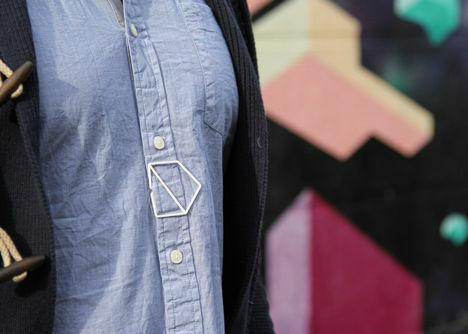 It is indeed a new way of wearing jewelry. Very interesting. Not sure that it really screams jewelry to me!!! To each his own. That's the point - understated especially for those who don't like too much bling. It is different and new. Sort of like a modified pin or brooch - though not as ornate. 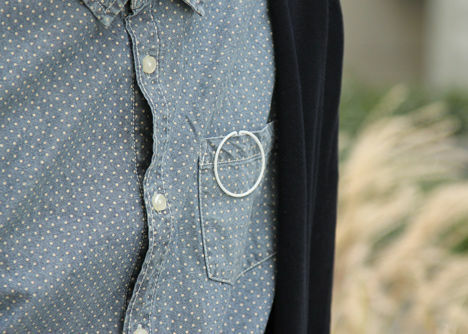 The clips do require some type of edge in which to support themselves on, so one would be hard pressed to wear the clips with a pocketless, turtle neck. Wonder if thick, stretchy fabrics, like bulky, hand-knitted sweaters, presents a problem? I do like the way they dress up the simple necklace of the dress or shirt in the first picture. It's very attractive. Just when you think you've seen everything! It's a combination of subtle & industrial look. Looks Minimalistic for my taste but the first picture shows that when you combine more, you can make a statement. What a unique idea, and very effective! I particularly like some of the smaller pieces clipped to the neckline of clothes, it really does look like a necklace without the chain.